Nowadays, getting anyone to pay attention to our message is harder than getting a teenage off of Social Media; we continue to push creative boundaries to engage people using the newest innovations from games to branded content. While these emerging forums of communications are often based on the latest technologies, the hottest trend in marketing today just might be the ancient art of storytelling. The challenge for startups is to be a good storytelling. They were good developers, product visionaries and entrepreneurs but they may not have the skills and insight to create compelling stories. 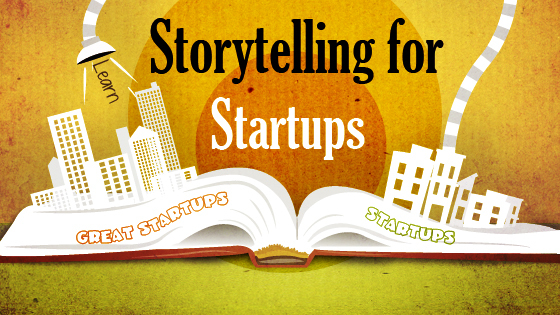 Do you know why storytelling is most important for the entrepreneurs? Research shows that telling stories actually helps people to understand the information you are sharing. In a recent study, the London School of Business found that 5-10% of people retain information when you simply share a statistics, and 25-30% will retain it if you include a story with your statistic. But if you simply tell a story, 65-70% will retain the information you shared. That’s powerful! Let’s continue with the experts words. “Marketing is Storytelling. The Story of your product, built into your product. The ad might be part of it; the copy might be part of it. But mostly, your product and your service and your people all are part of the story. Tell it on purpose.” – Seth Godin. All the startups have this common question: “Why does our company have to say story to the customer in a social media, in a case study, in a newsletter etc. and why will anyone care?” Everyone has stories. It’s important to tell our stories by drawing on real life examples and telling stories through characters your audience will resonate with, the stories will be the one people wants to hear. Brand happiness is created from Trust, Choice and Freedom. I think stories are able to create happiness when they help us to tell brands of trust, brands of choice and brands of freedom. If we want customers to tell happiness stories with our brands as actors in the story, we have to focus on getting brands stories to overlap around trust, choice and freedom. That’s not to say people won’t be moved to buy brands without these stories but it’s likely they will move quickly to other brands. Creating happiness allows you to create fans and generate long-term relationship. All brands have customers, the people that buy the brand, but few have a substantial fan base. The difference between fans and customers is behavioral. Fans are the type of customer that feels they are brand stakeholders. Fans go out of their way to buy and use a brand. They talk about the brand for you, harnessing the power of story through word of mouth. They position your brand better than you will. To your other customers they are the authentic voice of the brand, more so than you. Whether you are telling the story of your brand or telling a story about your industry, it is extremely important to tell the truth. If you aren’t truthful, people will know. And once one person knows, Everyone will know. The last thing you want it to be known as dishonest. What is your brand and company about? Do you pride yourself on excellent customer service? Are you innovative, quirky, fun or just really believe that your products or services are great? Define what makes your company great, work out how you are least like the competition and tell that story. Attracting kids and teenagers is the important weapon to keep your brand in market as successful. Attract them by using colorfulness, make fun and use different cuties and animal characters. Because our mom’s always prefer the brand that attracts their kids. If your story doesn’t divulge something personal or unfamiliar about your brand or business, your story could end up being boring. People don’t spend time with boring stories – they move on to something that is compelling and engaging. Don’t let your brand story get skipped over. As a marketer, you need to be the mentor and turn your customers into hero. Let the customer feel as a hero about your brand. Because hero’s never let your story down. Your stories need to give people a reason to come back. If you provide a service, you don’t want to give away all your tricks before a potential client is engaged, but equally you need to give enough to hook them. Meaningful, consistent content across multiple channels, will give people a reason to return back again and again. Think about what is interesting to your audience as consumers and work that storyline. What interests you as an insider may not match up with what consumers are interested in, and that’s okay. But who is the story for? Tell the story for your audience, and always keep their interests in mind throughout the creative process.